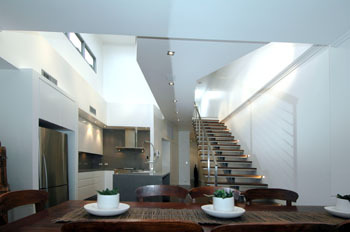 Explorations in a light filled open plan semi, plus a bridge! Words most spoken when visitors enter this house is "wow - the bridge". It wasn't always like this of course. 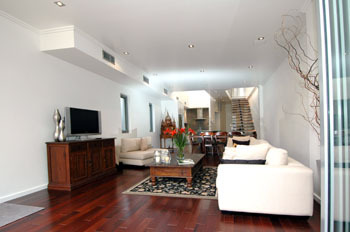 The dwelling was a typical Californian bungalow located in Randwick. A modest budget was distributed to the greatest impact - where it is was warranted. 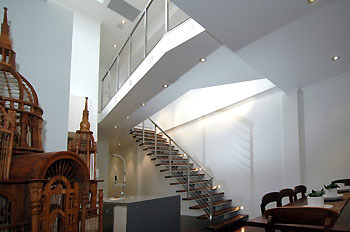 A striking overhead bridge separates areas and opened up the house to overhead light throwing light into the originally dark semi. A great space opener with amazing feel and atmosphere. The bridge spans the upper level over a great void in the centre of the house allowing lots of light into the central ground floor area. 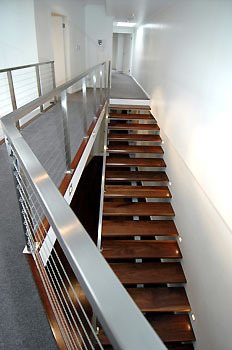 The bridge has a crank set on angle to the rectilinear plan providing great interest through the house. A combination of architectural ideas pervades this view with the descending stairs adjoining the double height kitchen space and beyond the more-constrained height of the dining and living rooms acceding to the ultra high bifold doors in the rear. What was a dark hallway has been transformed into a light filled corridor with lots of storage space. The cupboards are frameless allowing them to blend into the walls which are set on angle to open up the views to the rear. 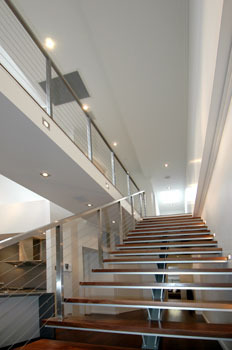 The stained timber stairs offsets the stainless steel balustrade. 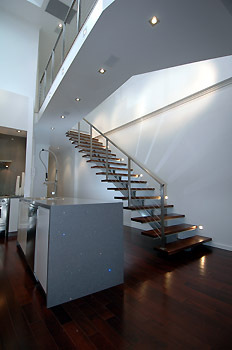 As you ascend the stair, notice the side lighting to the bridge. The timber of the stair continues along the bridge linking the bridge with the house not just in function but also in design. Being a semi-detached house, there are no windows along one side of the house. 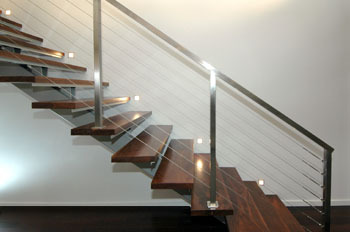 This also tends to elongate the apparent length of the house. 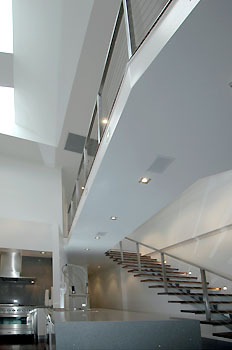 By using a system of features such as alternating ceiling heights, this elongation is reduced. 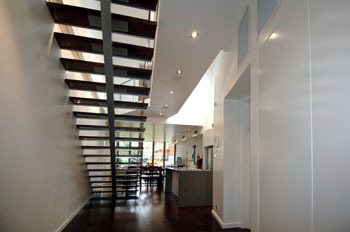 The detail of the stairs are refined by using floating solid timber treads and using an open riser. Careful attention to detail was given to the underside of each tread and this allows further light and views through the house. 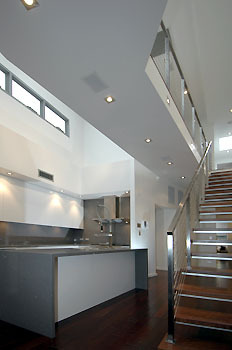 The bridge floats over the kitchen in the void. One is forgiven for not realising this is in an attached residence. The kitchen is minimalist in keeping with the house. The highlight windows throw light throughout the house. 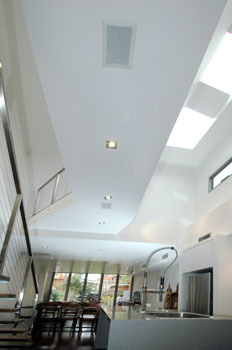 The skylights are showing in this view adding to the light source. The underside of the bridge shows concealed speaker systems. The entire house has smart house componentry. From the stairs the large dining + living rooms can be seen to open up to the rear garden and deck through tall bifold doors. 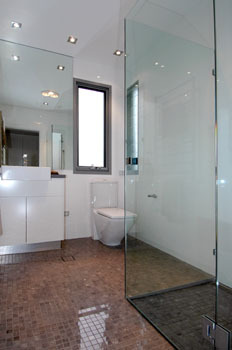 The guest bathroom is lined with stone tiles and is in keeping with the minimalist house design. Type of project: Alterations and additions to the existing semi-detached house including addition of new level and excavation below. Site features: Tight site with parts of the rear along a water gully. Received approval for off-street parking for one car despite protests from Council. 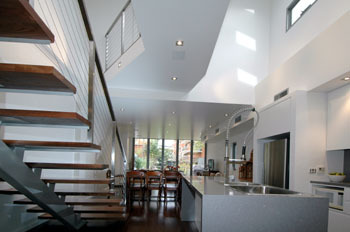 Architecture highlights: Internal bridge with highlight windows in conjunction with skylights. Light filled interiors. 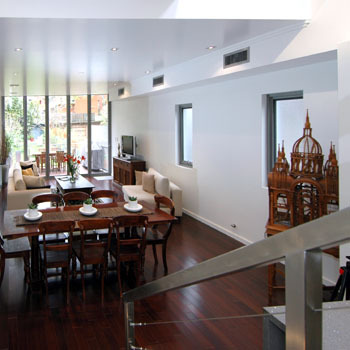 Internal spatial planning was revitalised and opened up to the large garden.